The Sutter Gold Rush Lodge, located in the Montgomery Estates neighborhood of beautiful South Lake Tahoe, is a perfect retreat for the family to gather, relax, and explore all that Tahoe has to offer. 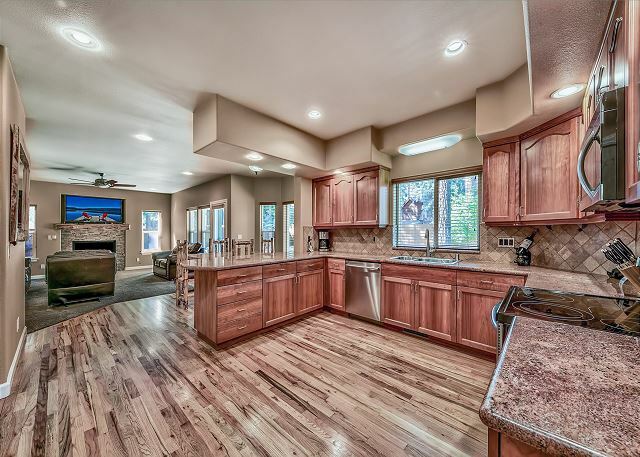 This home features spacious downstairs living, the first floor features an open living room highlighted by a gas fireplace, a flat screen TV, and lodge style furnishings. The adjacent kitchen is well equipped for your gourmet meals, the kitchen includes: granite counters, stainless steel appliances, a microwave, an electric cook top, a drip coffee maker, and more. There is a breakfast table that seats 4 and a log bench at the counter. 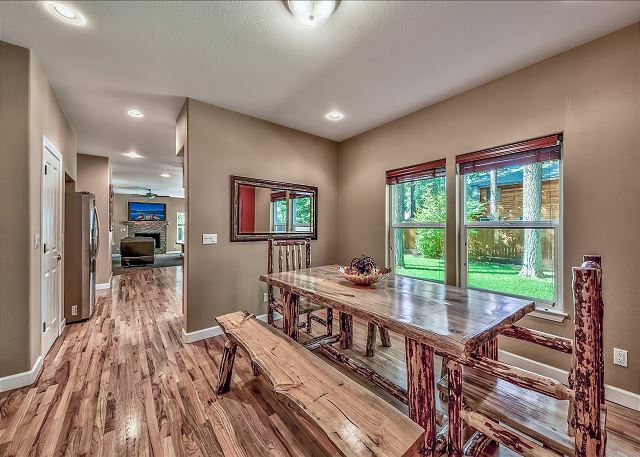 Between the kitchen and the family room there is a dining room with a log table, the table has 2 chairs and benches on each side. The family room has comfortable couches, shuffleboard, and a flat screen TV. 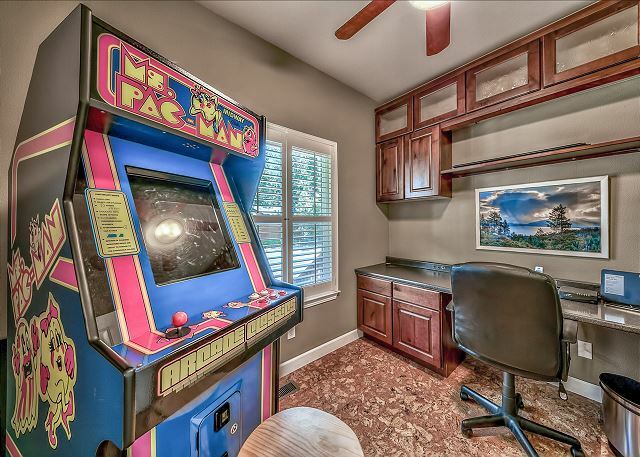 Additionally on the main floor there is an office with an arcade style Pac Man game, a half bath, and laundry. 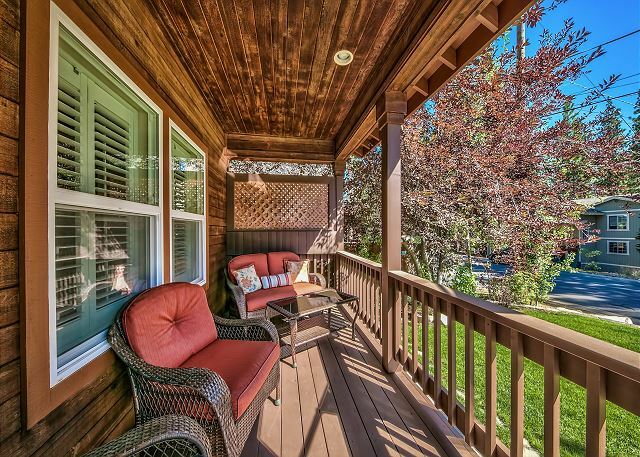 The backyard is a summer wonderland featuring a spacious deck, numerous sitting areas, a hot tub, and a gas BBQ. 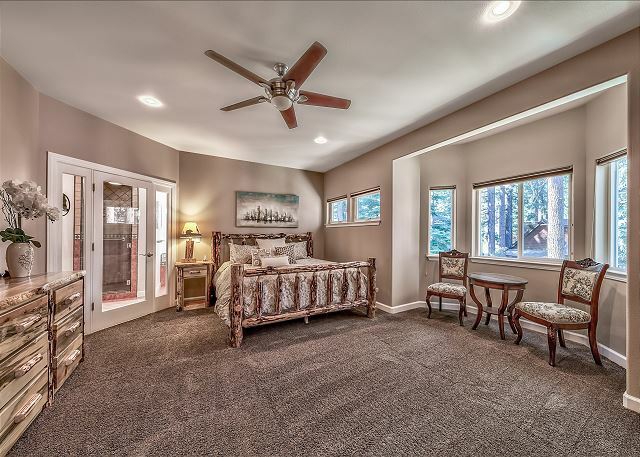 The property is beautifully landscaped and there is a large grass area for the kids to play on while the parents relax and enjoy our gorgeous Tahoe weather. All 4 bedrooms are located upstairs. 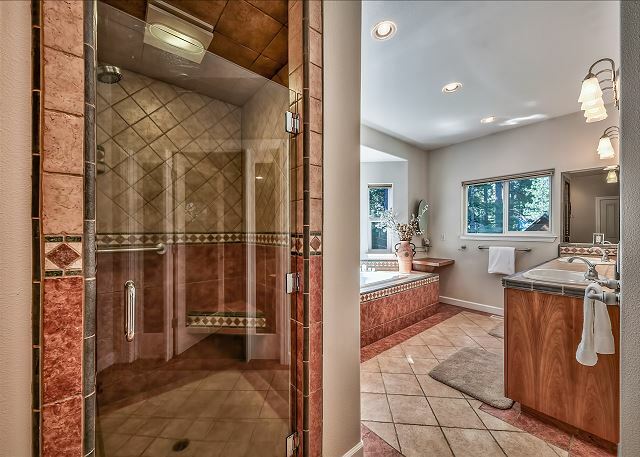 The master suite has a log king sized bed, log furniture, and a TV, the master bath has a separate shower and soaking bathtub. Bedroom 2 has a log queen sized bed and a pull out couch/futon. 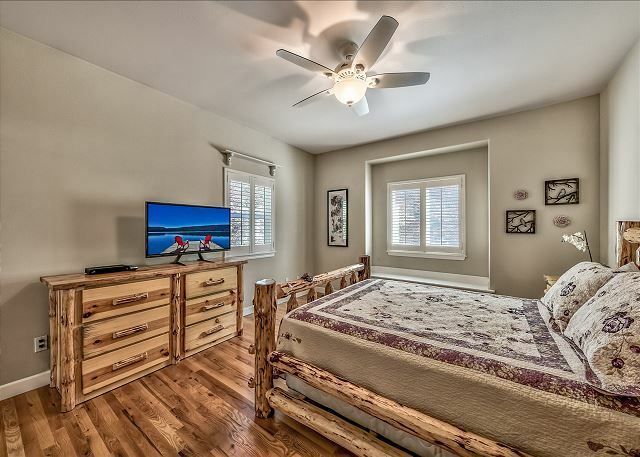 Bedroom 3 has a log queen bed with a TV. Bedroom 4 has a bunk bed that is a double on the bottom and a twin above, this bedroom also has a flat screen TV. This home is located in a peaceful and quiet residential neighborhood and we request that all guests respect that, absolutely no noise disturbances at any time. The hot tub may not be used between 10:00pm and 8:00am. This home has no Air Conditioning. This home has a 2 car garage and parking for 4 cars total. Montgomery Estates is located off of Pioneer Trail, it is a 4 mile drive to Heavenly Village, 3.6 miles to the Main lodge. Lake Tahoe and the beaches are all within a 10-20 minute drive depending on where you want to go. There is a video camera operating on the front entry way. Overall, we had an great experience. It is a great place to vacation with family. The beds are comfortable and the house is beautifully furnished. It would be helpful if they included amenities such as a complimentary shampoo, and body wash. We really needed a blender to make our family meals, and there was none. Other than that, my children enjoyed playing in the snow covered front and back yard. Tip:Take pictures of the decorations and house when you walk in.I was wrongfully accused of removing some of the decorations. The property manager makes herself available when needed, and I really like that type of customer service. I would give business to Pinnacle Lake Tahoe Getaways in the future. Thank you! We apologize about the emails, we were not accusing you just looking to locate the decorative bowl. Our stay was perfect! Honestly, I was very skeptical due to low company reviews and no reviews for this property at the time, but we were running out of options for our Christmas home away from home and decided to take a chance on a property that gave us ample space within our strict budget (it was actually a lot less than we expected to pay for the holidays). I contacted the rental company a couple of times prior to our stay and they were always prompt and professional which eased my skepticism. We arrived and the property was just as pictured. There was plenty of space for everyone ( especially considering we were at max occupancy)and great entertainment/ activities for all ages. We spent countless hours and late nights at the shuffle board and I think we're all pros now. The check-in process was simple, the house was very clean and well equipped,and we had absolutely no issues during our stay. I would absolutely stay here again and recommend this property to anyone. Thank you so much for the comments, we greatly appreciate it. We hope you stay with us again.